Coconuts are used as toppings on cakes and pies in foodservice establishments. Wholesale coconuts have become key ingredients in several food dishes and desserts. You can buy bulk coconuts from the restaurant supply leader. We sell coconut shredded and flaked and you can get it unsweetened or sweetened. We also stock dessicated coconut if you prefer. Kerry Tropical Rum Coconut Batter Coating - 5 Lb. Kerry Tropical Rum Coconut Breading Coating - 10 Lb. Coconut Bakers Display - 14 Oz. Coral Bay Toasted Flake Coconut - 10 Lb. Coco Tropics Cream of Coconut - 15 fl.oz. Coco Tropics Cream of Coconut - 57 fl.oz. Native Forest Organic Coconut Oil - 16 Oz. Native Forest Organic Bulk Coconut Oil - 1 Gal. Natural Coconut Water Original - 33.8 Fl. Oz. Natural Coconut Water Original - 17.5 Fl. Oz. Natural Coconut Water with Espresso- 17.5 Fl. Oz. Bobs Red Mill Coconut Flakes - 25 Lb. Bobs Red Mill Shredded Coconut - 25 Lb. Coconut Stacks - 2.25 Oz. Bobs Red Mill Organic Coconut Flour - 14 Oz. Bobs Red Mill Shredded Coconut - 24 oz. Bob's Red Mill Coconut Flakes - 10 oz. Bob's Red Mill Organic Coconut Sugar - 13 oz. Bobs Red Mill Shredded Coconut - 12 Oz. 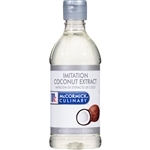 Davinci Gourmet Natural Coconut Syrup - 750 ml. Restaurant Coconut is great as a dessert topping or ingredient in your restaurant menus dessert section. Eating coconut is excellent for your immune system. They are antiviral, antifungal, antibacterial, and anti-parasitic which means they kill bad stuff. Chefs should try and make coconut cream angel pie, coconut chocolate cake, coconut macaroons, or even coconut brownies to tempt the taste buds of their restaurant patrons.